Ramy Ashour, Amr Shabana, Gregory Gaultier, James Willstrop, Mohammed El Shorbagy, Borja Golan, Tarek Momen, David Palmer, Peter Barker, Darren Selby, Wael El Hindi, Ong Beng Hee, Adrian Grant, Cameron Pilley, John White, Miguel Angel Rodriguez, Lee Beachill, Stewart Boswell, Aslan Iskandar, Alister Walker, Shahir Razik, Jonathan Kemp, Steve Coppinger, Marwen El Shorbagy, Ali Farag, Nicolas Mueller, Karim Addel Gawad, Fares Dessouky, Paul Coll, Mohamed Abouelgar, Ryan Cuskelly, Omar Mosaad, Saurav Ghosal, Gregoire Marche, Zahed Mohamed, Mathieu Castagnet, Nafizwan Adnan, Adrian Waller, Chris Simpson, Tom Richards, Mazen Hesham, Greg Lobban, Raphael Kandra, Joel Makin, Ivan Yuen, Nicol David, Alison Waters, Madeline Perry, Laura Massaro, Shelley Kitchen, Lauren Briggs, Annalize Naude, Low Wee Wern, Tesni Evans, Deon Saffery, Sarah-Jane Perry, Victoria Lust, Camille Serme, Joelle King, Joshna Chinappa, Donna Urquhart, Jenny Duncalf, Christine Nunn, Elise Lazarus, and Delia Arnold. Nick's Tennis customers include Wimbledon Champions Goran Ivanisevic, Pat Cash and Jamie Murray. Very recently, at the 2016 British Grand Prix, in Manchester, Nick had the pleasure of stringing rackets for squash legend, Jahangir Khan. 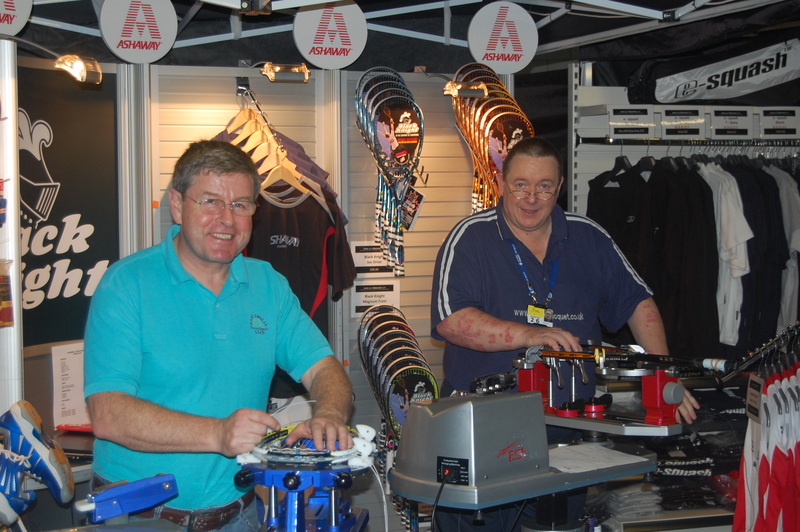 World Open Squash Championships at Sportcity in Manchester, with Liam Nolan (left) at the Ashaway/Black Knight Stand. WORLD TEAM SQUASH CHAMPIONSHIPS 2009 Odense, Denmark 27th Sep - 3rd October, Nick was part of the official Squashlife Stringing team with Chris Colls of the UKRSA. Amr Shabana of Egypt raising the trophy aloft, with France (2nd) and Australia (3rd) also on the podium.